By removing excess moisture from the air, reduce the humidity rate in any part of your place, our dehumidifier can prevent moisture damage and provide greater comfort for your life. Simple one-button control,easy to use to provide you healthy and enjoyable breathing air. 1.Large 2L capacity water tank. 2.Auto-Off and LED indicator when water tank is full. 3.Energy efficient with low power consumption. 4.Compact, portable and lightweight moisture absorber. 1. Do not place the power adapter in a wet or damp place to ensure the mid size dehumidifier can work safety in a well-ventilated area. 2. Keep the front air inlets and top air outlets free from being blocked when the dehumidifier is working. 3. Pour the water out when you don't need to use. 4. 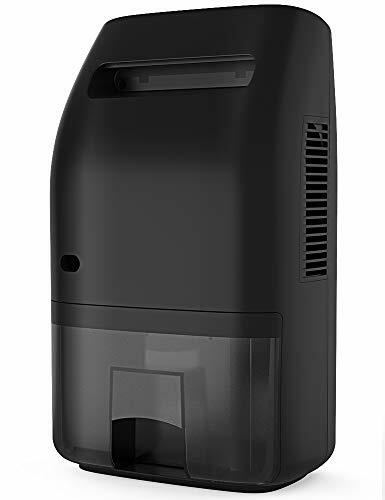 This is a small dehumidifier for small spaces, the dehumidification capacity is limited compared with the air compression dehumidifier. ✔ High-Efficiency & Powerful -- Quickly and efficiently remove moisture from your place, max capability of water tank is 2L(68 ounce), absorb up to 750±80ml(26 oz) moisture a day in 86℉, 80%RH environment. ✔ Healthy & Quiet -- Creates a healthy environment by eliminating bacteria, for those with breathing problems or allergies. Noise is below 42dB with no annoying sound, offer quiet and sound sleeping environment, which is perfect for small rooms and poorly ventilated areas. ✔ Convenient & Safety -- Powered through an AC cable, easy to remove front water tank, safe to use with built in auto shut off sensor. Automatic shut-off once reservoir is full, prevent an overflow of collected water, the portable dehumidifier works again when the reservoir is empty. ✔ Compact & Portable -- Mid size, takes up little space, controls mould, condensation and bacteria growth. Perfect for these places such as small room, office, bathroom, living room, kitchen, closet, ect. Portable design, easy to carry and find a place for it. ✔ Energy Saving -- Upgrade section dehumidifier with no chemical substances and low energy consumption, It is an Ideal environmentally friendly solutions for absorbing damp and condensation. Energy saving and eco-friendly, not waste electricity. If you have any questions about this product by Afloia, contact us by completing and submitting the form below. If you are looking for a specif part number, please include it with your message.